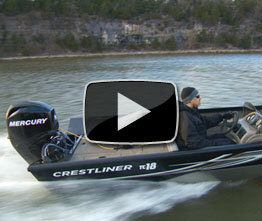 Polar Kraft Kodiak Sport 170: Fishing, or Family Fun? Yes. Those in search of an aluminum fish-and-ski who look at the Polar Kraft Kodiak Sport 170 will have trouble looking any farther. 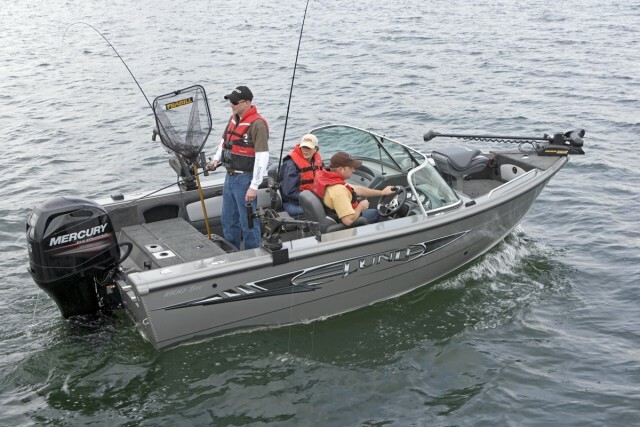 When it comes to casting in lakes, bays, and rivers, it’s tough to beat aluminum fishing boats for all-around utility, performance, and versatility. So, why do fiberglass boats so often seem to rule the roost? The biggest complaint about aluminum boats is the way they look, but new finishes have more or less put an end to that issue. That’s quite clear with the Polar Kraft Kodiak Sport 170, which has a high-gloss urethane paint job. But the pictures tell this story; we don’t need to dwell on the point. The Polar Kraft Kodiak Sport 170: Yes, it is aluminum, and yes, it does look that good in person. Besides, even though we all want our boats to look good, it’s more than a little superficial to focus on a boat’s eye-appeal. So let’s take a glance beneath that shiny urethane. 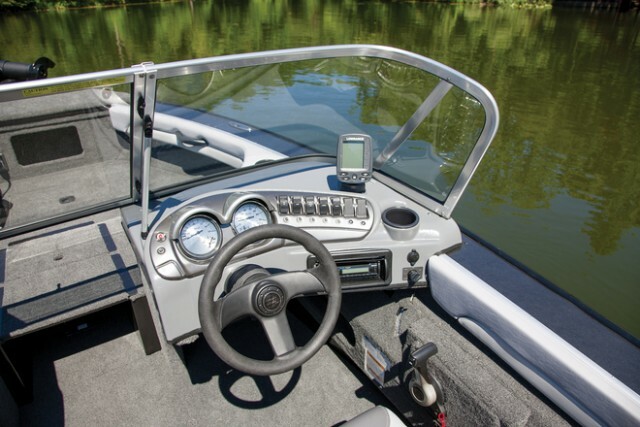 The Kodiak Sport 170 is a single-skin three-piece hull, double-rivited at the seams. The keel is double-layered for extra strength, and lifting strakes and spray rails are extruded aluminum. Under the deck there’s plenty of closed-cell foam floatation, cleats are the pull-up variety, and carpet is 18-oz. marine grade. In a nutshell, the boat’s well-built. But, it weighs in at just 1,360 pounds. And this is one of the great advantages of aluminum construction. A similar 17 boat built out of fiberglass would weigh several hundred pounds more, and wouldn’t get along quite as well with a small, fuel-efficient powerplant. Even with just 90 horses on the Kodiak 170, you can expect to hit speeds in the upper 30’s or low 40’s and cruise at close to 30 MPH. The down-side? Heft also helps to knock down waves, and you can't expect the lighter hull to bull through seas the way some fiberglass models would. By keeping the power requirements modest, you’ll also keep initial cost down. You can find one of these rigs—trailer included—in the $25,000 range. 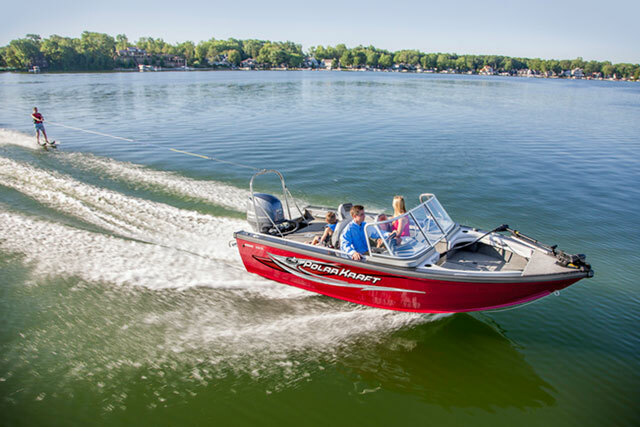 To take advantage of the “ski” part of fish-and-ski, you’ll want to add the optional ski tow bar. Yes, this will get in your way when the fish are biting, but like the old saying goes, you have to pay to play. The same is true of the bow cushions. Leave them in the garage when you head out for a day of casting, and tote them along when a sun-pad is in order. Compact but neatly laid out, the helm is ripe for larger electronics. Like most boats of similar design, the Kodiak 170 holds a pair of fold-down jump seats in the aft deck, and can take a pedestal-mount chair or a bike seat on the foredeck. Fold those aft seats all the way forward and you’ll find a battery compartment on one side, and a 25-gallon livewell on the other. The livewell location is both a curse and a blessing; it allows for significantly more capacity than many livewells on boats of this size, but may prove a bit inconvenient when you need a minnow and your buddy is relaxing on the seat. There’s a second nine-gallon well in the bow. Rodboxes (or ski boxes, for those “fun” days) line the inwales, and a 55 Edge 12-V electric trolling motor graces the bow. If this were going to be my fishboat, I'd beef about the absence of rodholders in the gunwale; if you ever plan to go trolling, you’ll need to do some rigging on your own. The helm’s well-designed, with perks like Faria gauges and lighted rocker switches with breakers, but serious anglers will want to upgrade the standard-issue Lowrance X-4 Pro. There’s also a 12-V plug, and a pleasant surprise here is the tilt steering wheel with no-feedback steering. You’ll appreciate it when you start carving out turns at wide-open throttle. Another thing you’ll appreciate is the full wrap-around windshield. Many boats of this genre have smaller windshields or merely a wind screen at the helm, and when spray starts flying on a chilly fall afternoon, that protection becomes a big deal. 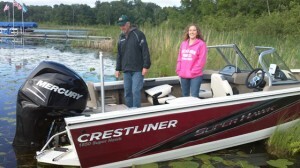 Almost as big a deal as all the fun you could have on this boat, with fishing rods one day and water skis the next. Other Choices: The Starcraft Starfish is a similarly-designed aluminum fishing/family boat interested parties will want to check out. 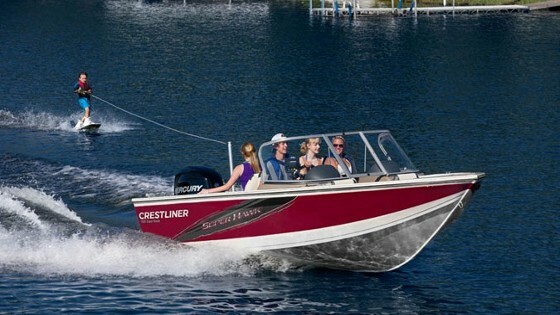 The Princecraft Sport 177 is another option with multiple uses in mind. 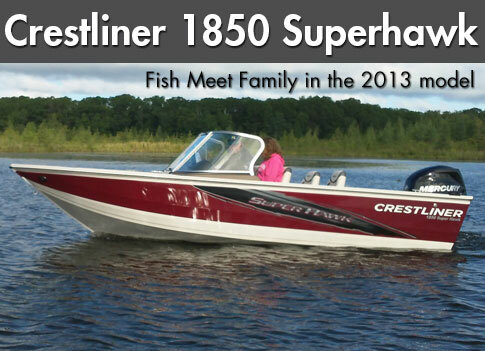 And the Crestliner 170 Fish Hawk tilts more towards fishing, and less towards multiple personalities. 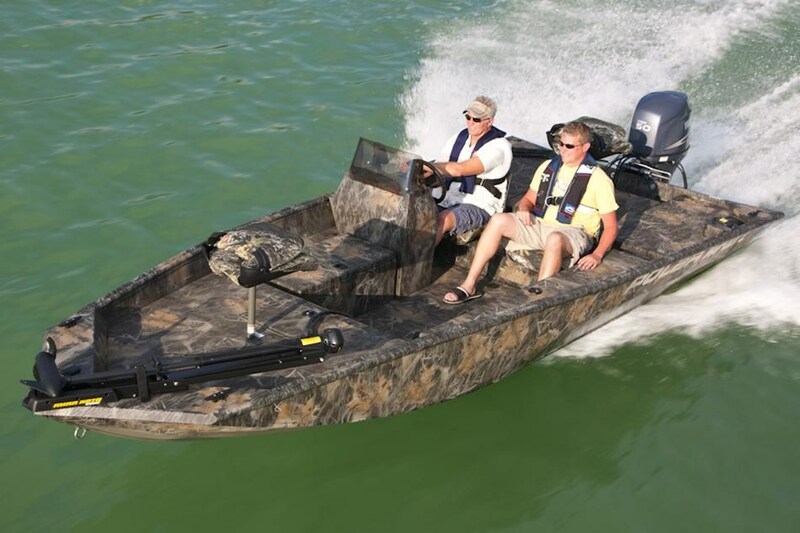 See Polar Kraft Kodiak Sport 170 listings. For more information, visit Polar Kraft.